The Gold Coast Dragon Boat Club was established in 1991 with many of its original crew being Gold Coast City Council employees. The Gold Coast Dragons attended their first Australian Dragon Boat Championships in Sydney in 1993. In 1994, with sponsorship, Gold Coast Dragons attended their first International Dragon Boat Regatta in Macau, China. In 1996, due to the need for independence and ownership of club direction, the Gold Coast Dragon Boat Association Inc became an independent incorporated association. We are a non-profit sporting organisation, who prides itself on having fun and keeping fit, as well as competing on a National and International level. 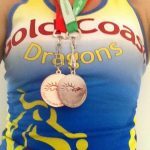 The Gold Coast Dragons are members of DBQ (Dragon Boat Queensland) and AusDBF (Australian Dragon Boat Federation). We believe this is an important aspect of our sport, as it assists with the development and direction of the sport in Queensland and Australia. Our sport is governed by IDBF (International Dragon Boat Federation) rules and regulations. Gold Coast Dragon Boat Club has achieved astonishing results both here in Australia and overseas, successfully competing at National and International level for over 15 years. DBQ is the state governing body for dragon boating in Queensland and is proud of its paddlers, their hard work, their team spirit, and dedication to the sport. With over 1000 paddlers, a 400% growth in the last five years, dragon boating has never looked so good. With clubs from Mackay to St George, from Brisbane to Tweed, people interested in dragon boating can choose from one of 18 clubs Queensland-wide. Over the years Queensland has won the right to contest in all categories at World Championships. Dragon boating has an esteemed 2500 year history and you can be a part of this amazing sport in 2017. Dragon boating in Queensland is only going to get bigger and better! The Gold Coast Dragons pride themselves on their involvement in the community. Due to the success our club has had with grants and sponsorships, we are often able to offer our resources back to assist other community groups and members. Gold Coast Dragons have hosted major Corporate fund-raising events for The Cancer Council Queensland. Varsity Lakes Sports House “Come and Try” Dragon Boating Days to promote fitness, fun and social interaction in the community. Youth in Search. Donation of use of 2 dragon boats to help raise funds for local charity. Samoan fund raiser: Gold Coast Dragons hosted a charity event in an effort to raise funds for the Tsunami victims of Samoa. Donations of boats to smaller clubs at Macleay Island and Ballina to help promote dragon boating in their communities. Successful corporate team building event held for Park Run conference delegates.